Transformation turns broken smile into show-off smile. 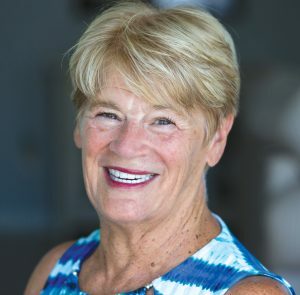 A painfully bad experience at a young age helped Anne Anderson develop what she refers to as “a healthy fear of dentists.” It was a fear Anne held on fast to for more than 60 years. During that time, another fear developed inside the now 71-year-old. Anne enjoys her new smile. “I reached a point where I was literally afraid to smile,” Anne relates. “That’s how bad my teeth looked. They were an absolute mess. There’s no other way to put it. They were crooked and yellow, and my gums looked terrible. And it’s my own fault they got that way. Avoidance is not unusual among those who truly fear dentists. Anne, though, eventually became an example of just how brutal the consequences of avoidance can be. Over the years, she lost several teeth, and many others were either decayed or broken or both. Repairing those problems was something Anne contemplated doing many times, but it wasn’t until after she moved to Florida a couple years ago and read an article in Florida Health Care News that she dredged up the courage to finally have something done. “I’m new here, and I was in the process of finding a new doctor when it happened,” Anne explains. “I was sitting in a doctor’s waiting room, and I saw the paper and read an article in there about a man who had a lot of the same problems I had. The dentist Anne read about in the article is Joseph H. Farag, DMD, of Port Charlotte Dental Care. Dr. Farag practices a full scope of general, cosmetic and implant dentistry, and by the end of his initial exam of Anne, he had already won her over. “He did a very thorough exam – x-rays, the whole bit,” Anne informs. “Afterward, we had a discussion, and I was just so pleased that he wasn’t telling me he was going to have to pull all my teeth starting tomorrow. “I was relieved by that. Then he asked me what my vision was of what I wanted to look like at the end. I told him I didn’t want to be embarrassed to smile anymore and that I’d really like to have good-looking teeth. That’s when he said, I think I can help you. Dr. Farag began the restoration of Anne’s smile by first addressing her gum disease, which is called periodontitis. In a person with periodontitis, the gums have begun to pull away from the teeth, leaving pockets in which bacteria can grow. The bacteria can lead to infection and tooth loss, which is what had happened to Anne. It was imperative, Dr. Farag explains, that he correct Anne’s gum disease first because the gums are the foundation of any healthy, appealing smile. Without a strong foundation, he stresses, there can be no support for any of the aesthetic work that would follow. LANAP is not the only treatment option for a patient suffering from periodontal disease, but Dr. Farag considers it superior to all others because it improves the attachment between the gums and the teeth and does not result in a gross loss of tissue or the height of the gumline and is pain free. A typical LANAP treatment in which the entire gumline is treated lasts about two to three hours and consists of several laser passes. During the first laser pass, the energy from the laser kills any bacteria in the gums, vaporizes the diseased gum tissue and dehydrates the tartar on the teeth, making it brittle and easy to remove. During the second phase of the procedure, the tartar is removed with a vibrating, fine-tipped, ultrasonic instrument. The teeth are then rinsed with an antimicrobial substance that stops the growth of new bacteria. This is also the step during which the diseased lining of the tissue is removed. Finally, through another pass of the laser at a different setting than the first, an antimicrobial seal is created that prevents re-infection and releases growth factors from blood cells that help to regenerate the attachment between the gums and the teeth. The entire procedure, Dr. Farag emphasizes, is painless. So is its aftermath. For patients such as Anne, who was scheduled to receive treatment for other issues following the LANAP procedure, Dr. Farag usually waits three months before beginning those treatments. During that time, he expects the patient to develop a good homecare regimen that will ensure the periodontal disease does not return. Anne was what Dr. Farag refers to as “a good patient.” She did such a good job of sticking to her homecare regimen that Dr. Farag began attacking some of the other issues she had with her teeth after only a couple of months. The first issue he took on was replacing the missing teeth. 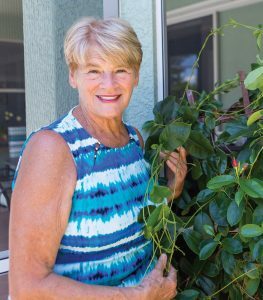 Anne is proud to show off her smile and her mandevilla. Over the years, Anne had lost two teeth on the lower jaw and two more on the top. She was given several replacement options to consider and chose to combine two different procedures to fill the gaps, opting for implants for the lower jaw and a unique prosthetic for the upper jaw. Considered the gold standard for replacing missing teeth, implants are artificial roots that are surgically anchored in the jawbone. The healing portion of the implant procedure usually takes three to six months. During that time, the implant fuses with the bone, creating a solid unit that becomes the foundation for a crown or possibly even a bridge. The prosthetic, meanwhile, is what Dr. Farag refers to as a “highly aesthetic cosmetic partial.” It’s polymer-based and adapts to the tissues and the teeth, so no wires or clasps are needed to keep it in place. This prosthetic masks any restoration work that was done but leaves the patient with the option of doing implants or something else later. The real winner, though, was Anne. “I knew I had to do something about my teeth. I guess I was just waiting for the right moment, and then I read that article, and it inspired me to finally get the work done, and I‘m so glad I did,” Anne says. “The experience I had has been life-changing. It really has. And Dr. Farag, well, I just can’t say enough about how great he is. He’s amazing, so if you’ve got any issues with your teeth and you want a really high-quality dentist to do the work for you, see Dr. Farag.